Jim Mitchell is chairman of Slow Town Mobile Meals. A man with a big heart, he resolutely determined to take on the daunting challenge of reversing the important charity's woes and successfully rescued it from near demise (as Sedge Mobile Meals) in August 2014. The charity had a critical function in this community of providing a minimum of 1000 meals a month to people who would otherwise go hungry. It did this regardless of age, colour or creed. Meals were cooked and supplied three times a week from Sedgefield Municipal Kitchen as they still are now. 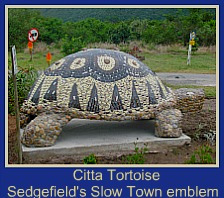 Smutsville residents in dire situations like chronic illness, extreme poverty, Aids orphans and frailty. This is done in conjunction with Masithandane. People who have fallen on hard times through no fault of their own. Homeless and jobless men and women of the road who wait patiently at the kitchen door. Short-term arrangements when a person is incapacitated through an injury or recovering from hospitalisation and requires a daily meal or two. This category usually pay the R30-00 per meal that is asked of people who can afford it. Donations from charity organisations, churches, and fundraising activities such as raffles, making pancakes, can collections and events. In this town many charitable organisations are interlinked and nearly all events take place with the aim being to raise funds for our local charities. For example, Ian Perryman, Chairman of Sedge Players used monies raised by The Farce Side play to create 55 “Christmas in July” meals. Slow Town Mobile Meals facilitated them being given to the Living Cornerstone (Alzheimer homes) and other folks on their “meals” list. 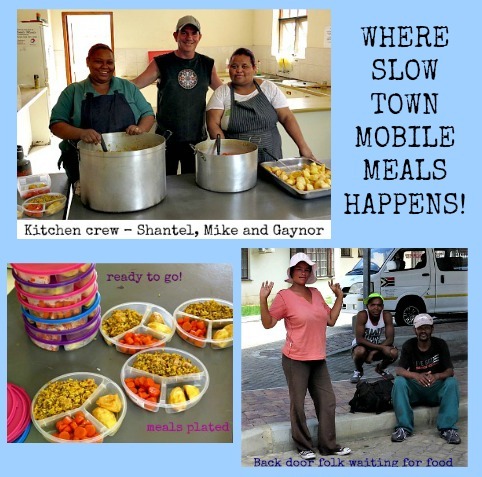 Like other local charities, Slow Town Mobile Meals gets a turn in benefiting from events such as the Knysna Wine Festival initiated by locals Gavin and Belinda Hobson. Gary at the popular local restaurant, La Piazza holds a monthly “Boerie Bash” for local business folks who provide items to be auctioned/raffled off at the evening gathering. 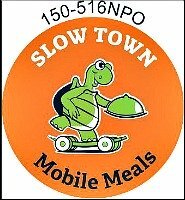 A specific charity is nominated each time and Slow Town Mobile Meals gets to benefit from it several times a year. Gary also organises a monthly Quiz night for general knowledge enthusiasts where teams “pay to play”, for the same purpose. Then, the Easter Slow Festival nominates charities each year to benefit from the three day event. 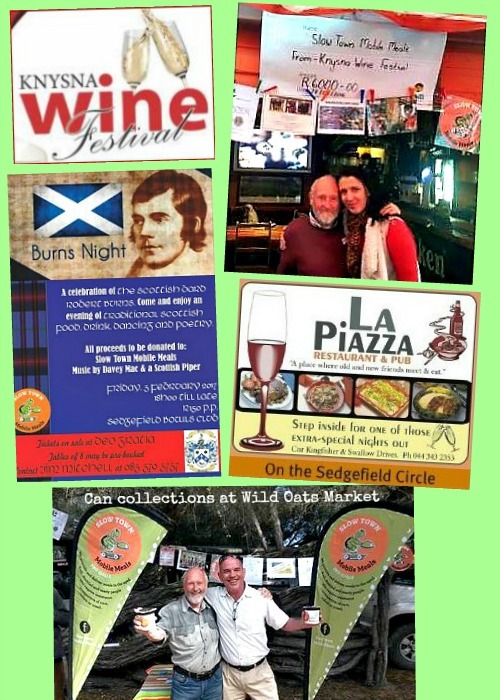 The Burns Supper evening held in February also raises funds for the charity. Pick ‘n Pay and other donors (often anonymously) contribute a variety of food and vegetables to the kitchen directly where it is centrally situated in the Sedgefield Municipal office building. Gilda Scammell who started Mobile Meals in 2007 provides 2 kitchen assistants. 1 is sponsored by a local donor. The 2nd is provided in exchange for meals provided 3 times a week to the residents of the TLC (The Living Cornerstone –Alzheimer houses). The charity is run mainly by volunteers and there is no “management charge” reducing income. The majority of all donations goes to the purchase of supplies used in the preparation of meals. A group of volunteers give their time to help with delivering meals and with various fund-raising events. Members on Jim’s committee, each have portfolios that contribute to the charity running efficiently and effectively. Saskia -Secretarial duties, Judith – bookkeeper, Beattie - buyer, Meg – client list control, and Angie -church liaison. Mike is the chef with kitchen assistants Shantel and Gaynor. From providing 12000 meals a year in 2014, the charity provided 14500 meals in 2016 so clearly the need for these meals continues to grow. The Non-Profit Organisation number is 150-516NPO. Receipts in terms of section 18A of the Income Tax Act 1962 can be issued to donors.